Educators, this TryaBox is just for YOU! Ozobot's brand new Evo Educator Entry Kits make bringing STEAM and coding simple to your K-12 classroom, library, makerspace, and more. Get future-ready while having fun with Evo, Bot Camp, and markers! Bot Camp is a booklet of activities designed to turn any Educator into an Ozobot Edu expert in just an hour. Discover Ozobot’s 2 Ways to Code—connected with OzoBlockly programming and screen-free with markers and Color Codes. OzoBlockly is powered by Google’s Blockly and has five skill levels from Pre-Reader to Master coding. Color Codes, made with markers on paper, bring STEAM to any subject and teach basic coding concepts, critical thinking, and debugging. When you’re done, browse Ozobot’s 150+ free STEAM lessons to use with your students and see how Ozobot is being used in 10,000+ classrooms every day. Tryazon will select 100 participants-educators across grade levels and subjects. Those chosen will receive a TryaBox with an Evo Educator Entry Kit experience. Learn more about the product by clicking the tabs below! 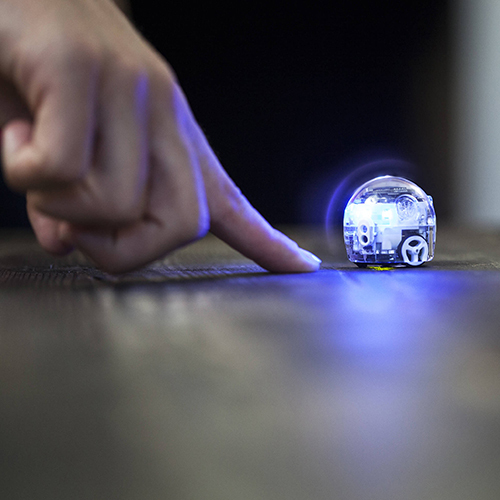 Ozobot makes robots that teach kids to code. Kids can code Ozobots two ways: online with OzoBlockly and screen-free with Color Codes. CEO Nader Hamda founded the company in 2012, with a mission to inspire young minds to go from consuming technology to creating it. Become an Ozobot master though Bot Camps! Bring this interactive, fun way to learn coding and collaboration into your classroom! All TryaBox applications need to be received by this date. Applicants will receive notification by email by this date. Those TryaBox participants who are accepted and confirmed will have their TryaBox sample packs shipped to them. TryaBox sampling begins at the beginning of February! Tryazon will select up to 100 participants for this TryaBox opportunity. Ozobot offers students a visual and untethered way to understand coding and computer programming… [They] help to foster collaboration and creativity in the classroom.